For the first time in the U.S., neurosurgeons used a 3D printed polymer implant in an operation on March 4 to replace a large part of a patient's skull. The so called OsteoFab implant technology that was used combines high performance polymers (PEKK) with additive manufacturing, or 3D printing, to create patient specific skull implants -- and received its 510(k) approval from the U.S. Food and Drug Administration (FDA) just two weeks earlier on February 18. The 3D printed plastic implant can replace the bone in people's skulls damaged by disease or trauma, according to manufacturer Oxford Performance Materials, and is helpful in these cases because skull implants should be adapted for each individual case and also come by quickly after an accident. 3D printed titanium implants are already available, but plastic has some advantages like not obstructing x-rays and being compatible with magnetic resonance imaging. 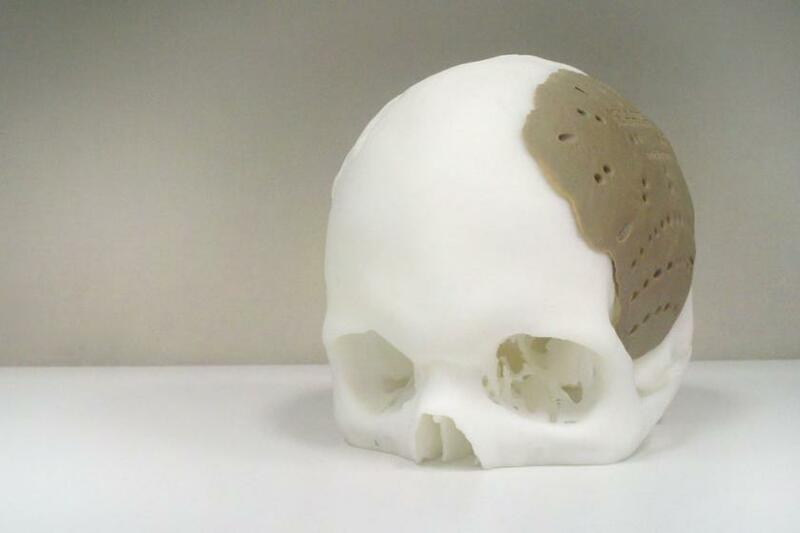 A general 3D printed implants advantage is the possibility to use an individually scanned model of a patient's skull, directly from CT scans or MRI, to "print out" a matching 3D object layer by layer. The precise manufacturing technique can even make tiny surface or edge details on the replacement part that encourage the growth of cells and allow skin to attach more easily. The 100% exact fit is very important because it saves valuable time during a surgery, which increases safety for a patient as the risk of infection is reduced, but also decreases the cost of the procedure. The OsteoFab™ Patient Specific Cranial Device (OPSCD)shown here is “grown” layer by layer by an Additive Manufacturing process (also called “3D Printing”) directly from a digital CAD file with few practical limits on what can be produced. "It is our firm belief that the combination of PEKK and Additive Manufacturing is a highly transformative and disruptive technology platform that will substantially impact all sectors of the orthopedic industry," said Scott DeFelice, president and CEO of OPM. Estimates are that about 300 to 500 U.S. patients are in need of skull bone replacements every month, which includes patients with cancerous bone in their skulls, as well as car accident victims and U.S. military members suffering from head trauma. The company indicated that it expects to not just make the OsteoFabTM Patient Specific Cranial Device (OPSCD), but to make 3D-printed bone replacements for all parts of the human body. DeFelice's company says it already began preparing to submit other 3D-printed bone parts for FDA approval. OPM also already begun selling 3D-printed implants overseas a year ago because it previously met an international standard. But the FDA decision has opened the door for U.S. surgeons using the implants. To make their implants, OPM uses the most advanced laser-sintering machine on the market, the EOSINT P800 made by the Munich, Germany based company EOS, which is the first capable to "print" the special polyetherketoneketone (PEKK) material that has proved suitable for human implants. As an implantable polymer, PEKK is unique in that it is biocompatible, mechanically similar to bone, and radiolucent so as not to interfere with x-ray equipment. Furthermore, OPM has recently completed testing which confirms that their OsteoFabTM implant surface is, in fact, osteoconductive which means new bone material can attach to it and grow. The company runs a biomedical-compliant manufacturing facility in South Windsor, CT, that can print bone replacements fitted for specific patients in a matter of days.